Plug-in hybrid engined cars are set to become even more attractive to drivers looking to cut fuel costs and emissions, after the UK government revealed a £37 million funding package to help pay for new plug-in charging points. As part of the package, the government will cover up to 75% of the cost of installing charging points for electric vehicles in garages and driveways. 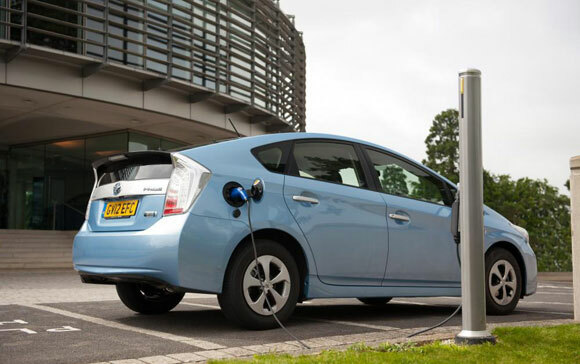 The Department for Transport says that the cash will benefit owners of cars like the Toyota Prius Plug-in Hybrid, which can travel up to 15.5 miles on battery power alone. The government will provide 75 per cent funding to people installing charge points at home, to local authorities installing rapid charge points, or to train operators installing new charge points at railway stations. The money comes from the government’s £400m commitment to increase the uptake of ultra low emission vehicles and is available until April 2015. Transport Secretary Patrick McLoughlin said: “This investment underlines the Government’s commitment to making sure that the UK is a world leader in the electric car industry. Up to £13.5m will be made available to UK homeowners wishing to install a domestic charging point. An £11m fund will be created for local authorities in England to either install on-street charging for residents who do not have off-street parking or to provide rapid charge points in their areas around the strategic road network. Up to £9m will be available to fund the installation of charge points at railway stations. Up to £3m will be made available to support the installation of chargepoints on the government and wider public estate by April 2015. A previously-announced £280k of funding will expand the Energy Saving Trust‘s Plugged-in Fleets initiative in England to promote ultra low emission vehicles to public and private sector fleets. The government also announced plans to review its buying standards to lower the fleet average CO2/km of new cars and encourage the uptake of plug in vehicles in central government. Read our other posts about Toyota Hybrid vehicles here, or find out more on the Toyota website.